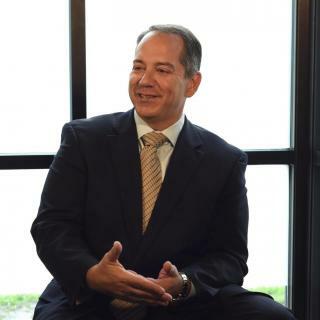 James Spiros is the founding partner of Spiros Law, P.C. He is a skilled litigator with experience in cases involving workplace injuries, serious traffic and trucking accident, defective drugs and devices, medical negligence, wrongful death, and nursing home neglect and abuse. Since 2004, James has consistently been named one of the Leading Lawyers in the State of Illinois by the Chicago Daily Law Bulletin Publishing Company. James earned an undergraduate degree at Purdue University, and a J.D. at The John Marshall School Law School in 1994. He and his wife, Stephanie, have two sons. Spiros Law hockey commercial representing our personal injury law firm in central Illinois with offices located in Danville, Champaign, and Kankakee. If you have been in an accident or injured due to someone else's negligence, contact an experienced Kankakee personal injury lawyer from Spiros Law, P.C. by calling (815) 929-9292.